V.L. Jennings' Official Website- Exploring Human Potential, Soaring Among The Stars: I need your help! Name that program! I need your help! Name that program! I need a name for a program that checks the chemical and elemental composition of an object in space. something that would check to see if there were any lifeforms or potential for life forms... any ideas? If your idea is chosen I will be sure to add your name to the acknowledgement section of the book when it is published! Jean realized in awe that a comet was coming slowly into her view. She spared a few seconds to peel her eyes away from the viewscreen to make sure her instruments were recording the comet’s majestic passing. Sure enough, they were all doing what they were supposed to do. Crediting the [previous to this passage] strange signal to her bored imagination, Jean welcomed the chance to observe the passing comet. Jean crossed over to another window to get a better view and realized the “comet” didn’t look quite right. It was round, but instead of the usual comma tail, five spire-like objects extruded from its sides bending backward to meet and produce a fiery tail. Uneasiness filled her stomach. Jean jumped as the (Insert Name Of Program) sent out an alarm. She ran around the center circle and rounded on the culprit computer console. Jean frowned as she realized what the huge load of information scrolling down the blue glowing screen was trying to tell her. Horrified and mystified, she turned to the viewscreen across the room. Slowly the comet’s pace slowed until it matched her own ship’s relative speed. 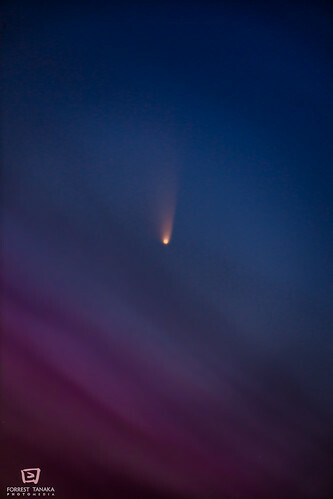 The comet turned slowly towards her ship, beginning its approach. Confused, Jean looked back and forth between the nearest computer terminals. One of them began screaming a proximity alarm. Six others sent out computerized voice messages meant to alert Jean to the comet’s possible time to impact, probable future course, and various choices of evasive actions to choose from. “Impossible!” She exclaimed, aloud, to the viewscreen. Comets just don’t change direction like that! Photo is not intended for the book. And wherever else books are sold! Did you like this post? If so you might enjoy my first book (while you are waiting for Visionary From The Stars to be released)! And remember! If you liked this excerpt or any of the other flash fiction pieces on my blog... you can sign up to get them straight in your e-mail box by plugging in your e-mail in the box on the right hand side!